KREYOL: Haiti Kanaval 2015 - Anpil moun inkyete sou zafè grèv ak manifestation ki programe e ki ka kreye pwoblèm pou moun ki ap pran lari pandan e apre kanaval... Caleb Desrameaux (Matin Caraibes) di ki ka moun ki ap tounen soti Jacmel Lundi alòs ke grèv anonse nan kapital la... Kisa-w panse? Caleb Desrameaux, one of the host of Matin Caraibes on Haiti Radio Caraibes FM was complaining about a potential Gazoline strike that is supposed to shut Port-au-Prince down on Monday 09 Feb 2015, the day everyone is returning from the Jacmel Kanaval weekend. Will these Haitian Carnival goers who were drinking the night before have to rush behind the wheel, half drunk, to get home before the protest? 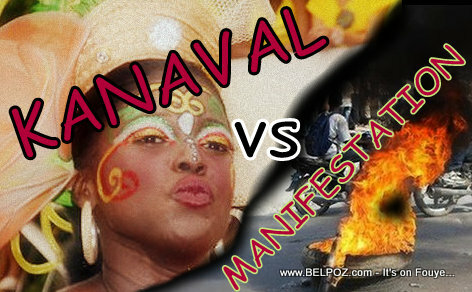 How many vehicles coming from Jacmel will be vandalized on that day?